Traffic Cones For Less is the nations #1 Traffic Cone factory direct distributor! We are an authorized direct seller of the worlds best known brands of traffic safety, including JBC Safety Plastic Inc, Cortina, Lakeside Plastics as well as our own brand of products! We are the traffic safety source for 1000's of the country's largest corporations as well as all types of government entities including the military, federal, state and local branches. We work with police and fire departments, construction and asphalt company's, landscapers, airports, FBO's schools, malls, valet companies, special events and quite frankly anybody who needs to control some traffic. No one is too large or too small to purchase from us, even if its just for personal use. Our warehouse is stocked with everything we sell for super fast shipping. We know you don't want to wait so we do our best ship out all orders same day. Place your order 24/7/365 fax (954-318-0440) or online Or by phone (888-388-0180) M-F 9:00 AM- 5:30 PM EST. A knowledgeable customer service representative is always available to assist you. Our new Text Us feature allows you to be in touch with us 24/7, when and where it's convenient to you Text Us at 305-342-9722. We ship fast. Orders received by 3:00 EST will ship out the same day via UPS or best way truck freight. Need something special? Ask us! YES we will ship to Hawaii, Alaska, Puerto Rico and any other US location. 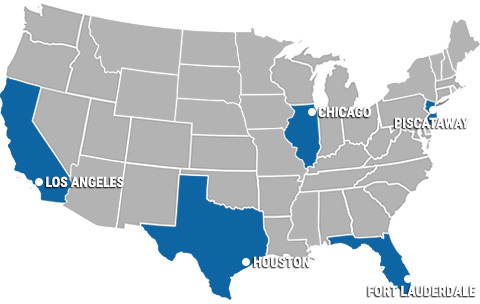 Five locations across North America and 1 in Canada allow us to offer speedy delivery and minimized freight costs. You get what you need, when you need it, at the lowest cost. We also work with all carriers, so if you would prefer to use your own account or own carrier, that's never a problem. We make it easy to enter your shipper information during check out. OES Global Inc is the parent company to Traffic Cones For Less & Hydration Depot. Our 2 companies work seamlessly together on even the most complex logistics. We pride ourselves on providing both the traffic control and hydration products to many of the greatest events and to some of the most remote locations all over the country. From desert rallies to mountain top marathons, from remote area street festivals to Hawaiian golf tournaments we are here to coordinate and deliver the products you need, where you need them when you need them.